Are You Looking For Baking Classes? I recently received a number of enquiries for suggestions on baking classes so I decide to share some of my experiences and findings here. This is where it all began for me. Four years ago, I started working on completing the requirements for the bakery arts certificate program at George Brown College offered by their continuing education department. It took me three years to complete the course requirement because I limit myself to one or two courses per term. The cost of the classes is cheaper than many private cooking school but it can still add up quickly. After completing the compulsory courses, it became clear to me which branches of bakery arts that I had the most interests in. Therefore, my choice of elective courses definitely reflected this decision. I took Chocolate Works (mastered the skill to temper chocolate without using a thermometer), Cakes--Classical To Modern, Breakfast Bread (made laminated dough until it became second nature), and Asian Baking. Personally, I was very happy with this program. It provided me with a solid understanding for baking which helped me to continue my exploration in this field on my own and with other pastry chefs. To be fair, the quality of each course depends on the teaching style of the instructor. Fortunately, I had a chance to learn from some excellent teachers. In most classes, students work in teams of two. Therefore, getting along with your partner in terms of personality and working style would make your experience much better. EC and I were partners for 6 courses and I was grateful to have her as a friend and partner. When I travelled to Paris in 2004, I took a couple of half day hands-on classes at Ecole Lenôtre. I chose the Pain d'Epice course and Opera course because they involved a great variety of skills. See my Paris Fooding Adventure posts for detail information on this experience. Is this a hands-on or demonstration class? What equipments/tools/materials am I require to bring to class? What is the baking background of the instructor? Do students get to take home what they make in class? For a basic general baking course, I highly recommend the 10-week Introduction to Baking course offered by George Brown College's Continuing Education department. It is very beginner-friendly and it offers a good overview of different disciplines within the pastry world. Taking this course would equip you with good basic knowledge before embarking on the more specialized workshops/classes listed below. I personally have not had any experience with any of them. If you have attended their classes, I would love to hear from you! Great Cooks offers classes taught by some famous chefs in the Toronto dining scene. Keep your eyes open for Joanne Yolles' pastry classes. JS Bonbons has chocolate classes at their Dupont location. Their chocolate classes are taught by Jen Stone herself. They also have guest chefs appearing at the school. La Bamboche posted a sign at their storefront on pastry classes offered at their store. I'm very curious but have yet to look for more information. Wilton certified cake decorating courses are offered at Michael's (various locations). McCall's School of Cake Decoration is also another popular choice for cake decorating classes. My friend EC took a series of cake decorating classes from Michael's and had good things to say about it. Upstairs At Loblaws also offer hands-on or demo baking classes. Since classes and instructors vary in every store location, my best advice is to keep looking until something catches your eye. However, after all that I said, my advice is to eat, experiment, and learn. Classes are useful to provide you with the basic knowledge but it is up to the individual to develop a hunger for a lifetime of learning. I love to write down notes on interesting flavour combination and inspiration. 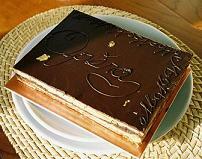 Tasting the great works of other pastry chefs opens my eye of the endless possibilities out there. After all, there is a certain element of artistic creation in the world of pastry, no? During one of our upcoming regattas, our dragonboat team daBoat will be responsible for preparing lunch for three teams of paddlers from Paddlers Anonymous. As much as I want to be there, I'll be racing at Inline 24 in Montreal instead. Preparing lunch for 80 hungry paddlers is no easy feat. Combine that with lots of other restrictions such as speed (less cooking a la minute), volume (assembly line production), storage (food must be safe to transport using coolers or sturdy at room temperature), taste (PB&J sandwiches for everyone just wouldn't cut it), and nutrition (nice balance of carbs, protein, & vegetable), choosing an appropriate menu would be crucial to the success of the meal. I don't have too much ideas yet but I would like to start brainstorming for possible menu items. I would like to help with the planning and as much advance preparation as possible. However, since I'll be traveling to Montreal the day before the regatta, I wonder how much I can help. dinner with Dad and T at Memphis BBQ. frantic packing session for dragonboat regatta on Saturday and inline marathon on Sunday. regatta at Milton was a success for our team daboat. Our time for the 500m race was 02:10, 02:08, and 02:09 for the three races. We had an awesome 250m race with a time of 01:00 thanks to our explosive starts. The 2K race was exhausting but so much fun. We passed 3 boats in front of us with some crafty steering from JS. I was happy to pace at the front row for the first 500m race and the 2K race. rushed back to Toronto as soon as the last race was done at 17:00. Showered and stuffed face with yogurt, bread, and dried dates. picked up EG at York Mills subway station at 19:00 and off we went to Ottawa. during my drive to Ottawa, I found out that ARA also invited a bunch of guys to stay in the same room. That was unexpected. EG was on the phone with GC and finally we decided that I would stay with EG and RA. Talk about last minute arrangement! arrived at the hotel in Ottawa by 23:15. As soon as I attached my time chip to my skate and laid out my clothes for the next morning, I went to bed. It would be an early start on Sunday. woke up at 05:30 and out the door by 06:00. We skated to the warm-up area. There were so many familiar faces and fellow skaters! squeezed myself to the front of the start line along with RH and SH. Races began promptly at 06:42.
crossed the finish line in under an hour! I had no idea at the time what my finishing time was though...I was too busy keeping my eye on the timing mat so that I wouldn't trip. hung out with lots of skaters including CS and JS. Met women world champion Beth Clark. She's absolutely an inspiration. couldn't find my name on the results page. I was a little disappointed not to know my time but oh well. Skated back to the hotel by 10:00.
happy to shower at last. Smelling clean makes me happy. chatted with friends from TISC. Everyone was in good mood from the great race and all the stories to share. Left hotel by 11:15. EG and I was circling around downtown Ottawa trying to find our way back to the highway. GPS is absolutely the most wonderful thing except when it's not working. 11:30 finally got on the highway! Pedal down and back in Toronto by 15:30. I was hungry like you wouldn't believe. Stuffed face with food, food, and more food. I was exhausted. I was sleeping by 19:30. For every beautiful and delicious dessert that I make, there's usually a spectacular failed experiment behind it. Like any failures, these baking mishaps can be great learning opportunities. If I'm lucky, perhaps it would be inspiration for a future successful dessert. I have yet to decide what fruit today's little mistake would bear. I was making a batch of coffee coconut macaroon based on a basic coconut macaroon recipe. The proportion is simple: 180g egg whites, 300g sugar, 215g unsweetened coconut. The original recipe called for 1 1/2 tsp vanilla extract for flavouring but I wanted the bitterness of coffee to cut the typical sweetness of macaroons. I desolved 2 tsp instant espresso in 1 tbsp water and added 1/2 tsp of vanilla extract and coffee extract for good measure. While the two trays of macaroons were baking in the oven, I decided to do something about the 1 cup of leftover batter in my mixing bowl. I didn't want to wait for the oven to bake them at the next batch because meringue cannot really hold for long. I've always loved ile flotant so I thought to myself "what's the harm in having some shredded coconut in my poached meringue anyway"? As soon as this thought crossed my mind, there was no going back. I poached all of my remaining batter to little dumplings and ate them as soon as I scooped them out from the boiling pot. 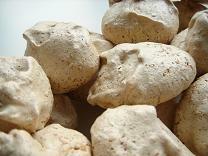 Well, the instant coffee in the meringue wasn't such a good idea. They dissolved in my poaching liquid. The coconut shreds soaked with water wasn't so good either but I think it would be rather nice if I use something else for my poaching liquid. The shape of the poached meringue can best be described as rustic but I think it's probably my own fault for not whipping the meringue textbook perfect and left them sitting for too long. Personally, I liked the poached coffee coconut macaroons but it would need some work before it is presentable as anything other than eat-them-while-they're-hot snacks for my own enjoyment. I fell asleep on the couch last night so I woke up a lot earlier than usual. With a bit of spare time on my hands, the only logical thing to do is to make a batch of muffins for breakfast. My recent favourite basic muffin recipe came from Joanne Chang's recipe published in the Feb/Mar 2006 issue of Fine Cooking Magazine. It is versatile, not greasy, with a very tender crumb. Best of all, I can come up with my own combinations of flavours easily based on whatever I like and have in my pantry. My last attempts with this recipe were very well received by my tasters. Since I did not have any fresh fruit (except for underripe bananas) in the house, I decided to raid my pantry for ingredients with "warm" flavours. I recently purchased a small bag of maple bits from Bulk Barn. They are like Skor Toffee bits except that they're maple flavoured. Of course, toasted walnuts and maple go hand-in-hand. To round out the requisite 2-cups of toppings, I added semi-sweet chocolate chips as well. For a stronger maple flavour, I used 1 tsp of vanilla extract and 1 tsp of maple extract that I bought a couple of weeks ago at Whole Foods. The muffins did not have the wow factor in terms of appearance but the maple aroma was absolutely fantastic. The flavour of this muffin was very mellow and I particularly enjoyed the still-melting chocolate chips when the muffins were fresh out of the oven. All in all, a delicious combination that did not require much work. C'mon, I whipped this up sleep-deprived and without caffeine in under 30 minutes. This ought to be a testament of how easy this recipe is. It's always a treat to observe a professional at work. I suppose this is one of the main draw of sitting by the sushi bar or eating at restaurants with open kitchens. Our dinner at the newly opened Cava on Sunday was nice. However, the most memorable experience with this meal was our waiter Brad. It was amazing to watch as he worked the busy dining room. With at least five tables of 10-course tapas tasting orders, he was the image of grace under fire. Well, that's to be expected from an experienced waiter. I was most impressed by his marketing skills. He did an excellent job of following up with questions/requests from diners. In addition, based on hints dropped by customers in a few sentences, he came up with a number of well-placed suggestions. In the end, the bill came out larger but instead of feeling up-sold, it felt more like good service. Although I'm a little indifferent about the food in our dinner, I left the restaurant in good mood because of the quality of service. It was enough to convince me that I had a good experience at this restaurant. Who said food is everything? Street parking available in addition to a couple of paid parking lots near the Queen & Bathurst intersection. I thought I liked beets but apparently I don't in a glass. 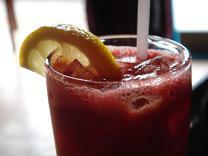 The beet-ness came through loud and clear even though the juice is sweetened by the carrot and apple. This is of course not the problem with the juice...just my personal preference. However, I must say that the deep red colour was very appetizing and made me feel so healthy. there's a changing selection of baked goods made in-house and I feel lucky that they had this tasty muffin on the menu on the day of my visit. When I first heard the name of this muffin, I immediately thought that it would be a moist quick bread made with mashed sweet potato and studded with dates. Well, I was only half right. The muffin was certainly moist and studded with dates, but the best part was the cubes of tender sweet potato found throughout the muffin! Baked sweet potato is one of my all-time favourite snacks and the cubes in this muffin certainly remind me of that. The muffin was gigantic with a huge muffin top. 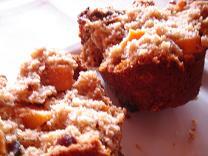 If you're a fan of crunchy muffin top, you will not be disappointed. Do not be fooled by the simple description of this dish because it is anything but. First, the fritter was mildly flavoured with curry powder and came with a dollop of mango jam. The sweet and spicy flavour paired well together. The fritter was served with herbed potato wedges, guacamole, salsa, toasted egg bread, pressed sunflower seed "crackers", and a green salad topped with strawberries and chickpeas. The crackers were addictively delicious because of the nutty rich flavour. 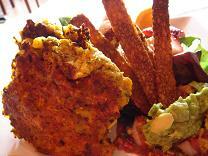 The potato wedges were flavourful and I liked the creaminess of the guacamole. This is a dish that can satisfy an empty stomach, be it herbivore or carnivore. Saturday brunch at Fressen is not super busy but the dining room did slowly filled up. I like the relaxing atmosphere and the attitude of the servers reflected the same. The pace was comfortable and service was efficient. 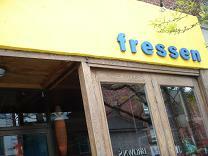 Fressen is one of the few non-ethnic upscale vegetarian restaurants in Toronto. After this meal, it's not difficult to understand its appeal: good food is good food, even if it is vegetarian. Flavour is not compromise here. I like the fact that the kitchen does not try to mimic traditional meat-oriented dishes. This is a restaurant that I would be glad to come back with my friends (not just my vegetarian friends!) simply because their food is delicious. I'm not much of a wine-drinker but my sweet tooth draws me irresistably to a Canadian specialty, cidre de glace (ice cider). If you haven't heard of ice cider before, it can best be described as a close cousin of ice wine, another Canadian specialty. Cidre de glace tastes great with apple, caramel, and spices. On the savory side, its sweetness offsets mild goat cheese beautifully. For this Fabulous Favorites Festival cohosted by Alberto and Lenndevours, I would like to prepare a composed dessert that highlights these flavours. 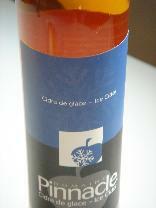 My favourite cidre de glace is the Signature Special Reserve made by Domaine Pinnacle. However, since the winery only makes a limited number, it is rarely seen outside of a few specialty stores in Quebec. However, during my annual ski trip to Mont Tremblant, I can always get a few bottles of the regular cidre de glace at the SAQ store inside the resort village. Preheat oven to 400F. Peel, core, and quarter the apples. Make a dry caramel with the granulated sugar. When the caramel turns a deep amber, remove from heat and stir in butter, salt, and cream. The caramel will sputter and bubble violently. Toss caramel with apples and spread into a glass baking dish. Bake for 30min. Remove from oven and cool to room temperature. Puree the caramelized apples using an immersion blender or food processor. Stir in apple cider and chill in refrigerator overnight. Process sorbet as per ice-cream maker's instruction. Preheat oven to 250F. Have a 6-hole 70mm demi-sphere flexipan ready. In a standmixer using the paddle attachment, cream the cream cheese, goat cheese, sugar, and vanilla until smooth. Add in the mascarpone cheese and beat until there's no lumps in the batter. Do not overbeat as the mascarpone cheese would seperate. Beat in eggs one at a time until each is incorporated. Fill flexipan with batter and smooth the top. Bake for 45 to 55 minutes until the cheesecakes are set with only a slight jiggle in the centre. Chill the cheesecake in the freezer and unmold while it is frozen. Let the cheesecake defrost in the refrigerator. 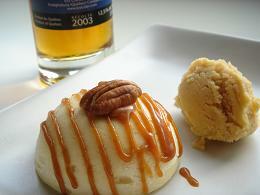 Just before serving, scoop a quenelle of caramelized apple sorbet and garnish with caramel sauce. I ordered the Takumi menu and T ordered the Waza menu. The Shochikubai sake was very sweet which I found very pleasant but in retrospect, it is probably not the best choice to accompany the food. a very light and refreshing shooter of asian pear puree. The sweetness is subtle. Fitting for a summer menu except that it's been a little cold in Toronto lately. The simmer octopus was served with a salted sakura leaf,a sakura blossom, and simmmered celery matchsticks. I love sakura flavour but the leaf and blossom used in this dish did not lend their flavour to the octopus or buterbur at all. 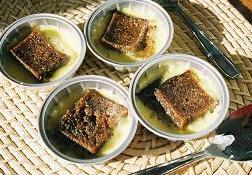 Despite of this, this is the most memorable dish of the evenign for me. The contrast between the octopus "wrapping" and the buterbur "filling" was amazing at both textural and flavour level. I was hoping for an explosion of flavour for the braised pork but my expectation came up short. The pork was lean and the flavour combined with the spring vegetable can best be described as clean. It was a very pure flavour that highlight the ingredients in their natural state. A very nice selection of sashimi that emphasized the attention to detail at this restaurant. The variety of sashimi was served at different temperature with the toro being noticeably colder than others to highlight the quality of the fish. The live shrimp was delicious. There was two other kinds of fish as well. The dipping soy sauce tasted wonderful without being overly salty. The wasabi was okay. The head of the shrimps were later served as a deepfried crunchy snack. I like cold tofu dishes in clear broth in general, especially in summer. This tamago tofu was silky smooth in texture and went well with the grated ginger and shiso in the broth. This was another dish that I liked. The bamboo shoot slices were juicy and sweet. They were served on a bed of wakame seaweed which was great for soaking up the sweet sauce. The main dish was alright. The lobster and eggplant were cooked just right. They were served with a grilled shrimp (a nightmare to peel off the shell) and a beggar's purse of whisper-thin egg wrapping stuffed with marinated vegetable. Honestly, I like the beggar's purse the most in this dish. Sushi is the name of the game here at Sushi Kaji. Here you will find one of the best sushi in Toronto. We first had a toro sushi that went under a torch for a slightly cooked surface. It was served with a sesame ginger sauce. Next came a trio of shell fish: cooked king crab leg, scallop with mango ume, and lobster. After the shell fish, we had shiroyaki anago drizzled with a sweet sauce and then Australian salmon that was served with a yuzu mayonnaise. All of the sushi were excellent and they were perfect examples of why Sushi Kaji is one of the best Japanese restaurant in the city. Each piece of sushi was a tiny work of art with the fish resting on top of a thumb-sized piece of rice. The careful combination of the fish with the sauce were innovative and delicious. The accompanying ginger was just right as a palate cleanser between each sushi, without being overpowering in terms of flavour. Here, you would not find any soysauce. Each piece of sushi could hold its own. Soba is soba. By this time, I was already very full from all the sushi to really enjoy this dish. Dessert is not this restaurant's forte. Although the mousse was lightly set with the minimum about of gelatin, the biggest impression was the creaminess and the smoothness of the mousse. Flavour-wise, it did not deliver. Like many people suggested, a meal at Sushi Kaji is best enjoyed at the sushi bar where you can see the master at work and chat with them & fellow diners. T & I were sat between two single diners who are regulars. The atmosphere was convivial and more casual than the price would suggest. I enjoyed myself very much. I was not particularly impressed by the way the dishes were served. The order that the dishes came out was different for every diner and sometimes, there would be two dishes on the table because they came out in very close proximity. Courses were not necessarily served at the same time for T & I. If I order a la carte, this would not be an issue. However, as a tasting menu, I would expect otherwise. It gave me the impression that the kitchen was not very organized. Sushi Kaji now only serves the $120 multi-course tasting menu. The a la carte menu is no longer available. It was a good meal and the portion was just a little too much. I definitely like the sushi and sashimi here. That being said, I was not blown away by the dishes from the kitchen. Sure they were delicious but they simply did not have the same refinement and restraint seen in Hashimoto. I would come back for the sushi and sashimi alone. However, seeing that I have no choice but to order the tasting menu, it's most likely that I would visit other sushiya for sushi and Hashimoto when I'm in the mood for cooked Japanese cuisine for the best of each world.